Kids love drama, love rap music, and will take a new look at poetry with this creative combination. Written to be presented independently, the lessons in this book give counselors the opportunity to incorporate a new "twist" into their guidance programs. Eight skits that can turn a guidance program into a fun classroom or assembly presentation. Topics include: peer relations, impulse-control, careers, character, tobacco/alcohol/drugs, and test-taking. Eight raps which each include a lesson plan with activity sheets. Topics include careers, bullying, self-esteem, empathy, bus safety, and stress. Eight poems which can be presented as complete lessons or as part of a separate guidance lesson. Topics include: first day of school, winter and spring breaks, test-taking, and anger. 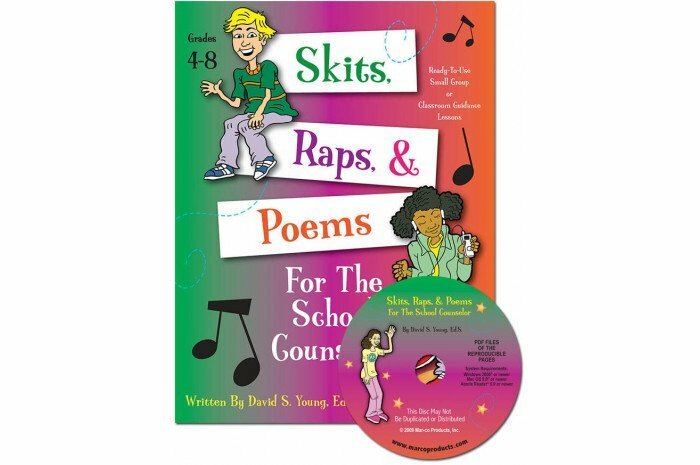 The CD features PDF files of the songs, raps, skits, and activities.